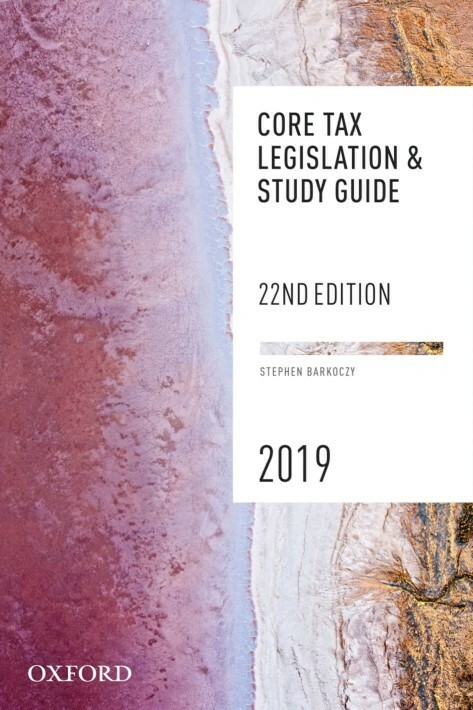 Core Tax Legislation & Study Guide 2019 is designed for students completing tertiary and professional studies in Australian taxation law. Bringing together the practical skills and key legislative provisions that students need to develop their understanding of taxation law fundamentals, this one-volume text is divided into three parts.Part 1 – Study Guide: provides a comprehensive approach to effective study practices and includes strategies and tips for writing assignments, exam preparation and research. A list of useful tax websites and journals is included for further reference.Part 2 – Core Tax Legislation: contains extracts of the key income tax, GST, FBT, superannuation and tax administration legislative and regulatory provisions that are required for the study of taxation law.Part 3 – Legislation Index: assists students to navigate Part 2 with a practical and clear layout that makes it easy to find the relevant provisions.This text incorporates all relevant amendments that have occurred within the last year and can be used with Foundations of Taxation Law 2019, Australian Taxation Law 2019, the Australian Tax Casebook 2018 and the Australian Master Tax Guide 2019.